Inquire about SNAP-owned, low-income rental housing managed by Coast Real Estate Services, or let us help you confront barriers to accessing housing. SNAP can help you start your new business or expand your existing business by providing business counseling, training, and loans. We are more flexible than your bank. This program has many methods and resources to help you establish new credit, improve existing credit, or disputing errors. Homebuyer’s Education Seminars will discuss down payment assistance programs available to home buyers to help you achieve home ownership. SNAP may be able to help make home heating more affordable by easing the financial impact of a portion of heating costs. SNAP may be able to assist with reducing your monthly mortgage payments through a modification or loan. Our home mortgage loan program is specifically designed to help low to moderate income homeowners with home mortgage loans to improve their financial situation. Homeowners may be eligible for 3% interest loans for home repairs required to make your home safer and healthier for occupants. Volunteer to advocate for long-term care residents, by offering companionship, preventing abuse, and improving dignity and rights. We can help homeowners determine what options are available to remedy your default and avoid foreclosure. This program helps households identify and overcome barriers to home ownership. Counselors provide information about a variety of special loan programs. Quickly connects individuals experiencing homelessness to permanent housing through tailored housing stability plans. SNAP can help to restore banking privileges to people who are unable to get a checking or savings account or who want to learn how to use one responsibly. Available for single, homeless individuals. 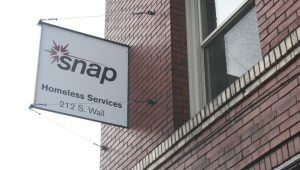 SNAP can perform an assessment to determine needs to find solutions. Spokane County’s only service for low-acuity medical transports to urgent care. We can reduce costs for clients who would struggle to afford the full medical expenses. that come with ambulance and ER. We provide emissions reductions by repairing vehicles that fail the state-mandated vehicle emission test in Spokane County. SNAP can help make your home more resilient to heat and cold by implementing cost-effective measures to improve energy efficiency. The Women’s Business Center is a one-stop business resource shop. Individual business consulting, premium business training, credit building and business financing. Do you have more questions or need specialized assistance? Our Information Specialists can help you access the resources you need!